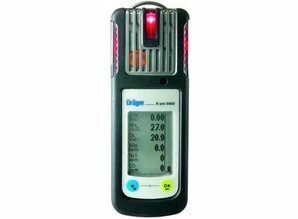 The Dräger X-am 5600 is the smallest Infrared capable six gas personal monitor. Offering the flexibility of either an Infrared LEL Sensor, Infrared CO₂ Sensor or a dual IR CO₂/LEL sensor. The X-am 5600 offers the same accuracy, durability and data-logging features of the X-am 2000 and 5000 series. It is compatible with all current X-am 1/2/5 series accessories. The Dreager X-am 5600 is suitable for use in areas classified as Class 1, Division 1, where explosive atmospheres are always expected. The X-am 5600 can be used in areas where, until now, only catalytic Ex sensors have been used. Why? Because Draeger infrared sensor technology provides increased poison resistance against normal contaminants of Cat EX sensors.